This month Elizabeth (Lisa) Liang takes a break from interviewing fellow Adult Third Culture Kids (ATCKs) who work in creative fields, to tell us about what it was like to perform her one-woman show about being a TCK as the closing keynote at last month’s Families in Global Transition (FIGT) conference. Hello again, Displaced Nationers! 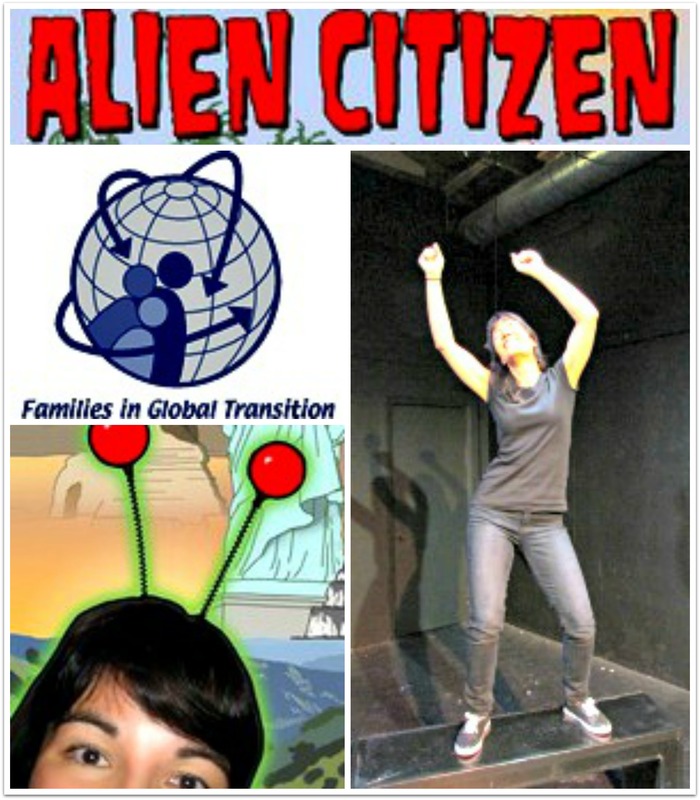 I was excited and anxious about performing my solo show, ALIEN CITIZEN: An Earth Odyssey, as the closing keynote at the Families in Global Transition (FIGT) conference, held March 21-23 in Virginia. Excited because the FIGT audience comprises ATCKs, global nomads, TCK parents, and various professionals (cross-cultural experts, therapists, school administrators, etc.) who help expat families with issues specific to their lifestyles—in other words, my target audience. I hoped that if conference participants liked the show, it could lead to more bookings. But if I was excited, I was also anxious. What if my work didn’t resonate with the FIGT crowd? That would signal a massive failure on my part as performer/writer. On the other hand, what if it resonated with them too much? Maybe the FIGT participants would be looking for something light-hearted by the end of two-and-a-half days. While my show uses humor, it also goes to some dark places. Would it make people uncomfortable? Of course I never know how my shows will be received, but I felt more was at stake at FIGT. As with other performances, I wanted people to laugh, but I also wanted them to be moved. 1) The audience was quiet at first. I couldn’t tell if they were bored or listening intently—we were in a ballroom and I was on a platform, not close enough to see anyone’s expression. But I didn’t want to lose sight of the storytelling so charged ahead as usual. 3) They listened intently. I began to realize this about twenty minutes in, which gave me the confidence to tweak some lines. The majority of the audience were my generation and older, so I sensed that if I said “I first fell in love with [Clark Gable] when I saw Judy Garland sing to him in THAT’S ENTERTAINMENT on our Betamax,” they would laugh. Normally I say “on video” because anyone younger than I am has no idea what a Betamax is. 4) I got a standing ovation as soon as the lights came up at the end. It felt warm and sincere and lasted a while. I hoped the FIGT audience would be pleasantly surprised by the show’s video projections and sound effects, since those are unusual elements in a conference setting. Everything I attended at the conference was fascinating and of excellent quality. But my piece was something else, something purely theatrical. At the show’s beginning, the room fades to darkness as you hear David Bowie’s “Space Oddity” and then see a projection of the moon flashing past the Earth. The lights come up and I’m standing on the platform with kooky headgear and a bobbly alien headband, grinning at you. One of my favorite memories of the whole experience was the Q2Q (or cue-to-cue) rehearsal the day before. The hotel staff were busy setting tables and preparing for the following day’s events. Several of them seemed bemused as they watched me performing excerpts so that the projections and sound cues could be rehearsed. My brother John was my techie, running the cues off of my laptop in the back of the room while telling the hotel’s A/V technician when to fade down/up the lights. John hadn’t worked in a theatre booth in something like 25 years, but you would never have guessed. And as my brother was taking on the mantle of stage manager/techie, the A/V guy started telling us how he could do some sound mixing during a tricky part of the show. Then another hotel staffer offered to give me some background lighting to enhance the effect, until the A/V guy told him it wouldn’t be possible to run light cues, so the staffer said he could at least set up the lights to have a nice glow for me from the start. To our delight, there were showbiz folks among the hotel staff. They loved having something to do other than give people mikes and set tables and were jazzed about what they saw, which boosted my confidence. My brother said that when the lights came up there were people who were trying to compose themselves before they stood for the ovation. For the next half hour, people came up to thank me. Some talked at length about how the show affected them, while others just gave me big hugs. A few ATCKs with swollen eyes lodged a complaint: they felt it should have been mandatory to have a box of tissues at every table! I recall one woman thanking me for “coming out” with my painful adolescent experiences, saying she had experienced the same when growing up in a foreign country. Another one said the show had changed her mind about theatre—she had no idea it could be moving and transformative. That’s a compliment to my director, Sofie Calderon, who made the show far more dynamic than I could on my own. Several parents of TCKs told me the show had given them a lot to think about, and one said she could now appreciate some of the issues she ought to be dealing with on behalf of her kids. To my relief given my initial trepidations, the response was overwhelmingly positive. I also felt, and continue to feel, gratified that people have continued discussing their impressions on blogs, Twitter, Facebook, and email. This confirmed what I’ve learned since the world premiere and through the show’s international tour: the story is relatable and interesting; it’s a testament to TCKs’ strength; and if a story is told with humor, people will listen to the darker side of it, and empathize. As I had hoped, FIGT has led to a new booking: I’m performing excerpts at the gala dinner for the World Bank Family Network, to be held in Washington, DC, on May 13. That’s right after my San Francisco premiere at the United States of Asian America Festival, sponsored by the Asian Pacific Islander Cultural Center, on May 10. Hey, if the show has antennae, it also has legs! Also, since I posted about ALIEN CITIZEN: An Earth Odyssey a year ago on the Displaced Nation, my dream of taking it Off Off Broadway came true this past September. And my goal to take it on the college circuit has come to fruition: I’ve performed the show or excerpts at Princeton, M.I.T., and CSULA, and today, April 10th, I’m taking it to my alma mater, Wesleyan University. Another desire of mine was to perform the show at international schools, and this, too, is beginning to be fulfilled: right after FIGT, I performed excerpts at two international schools and the U.S. Embassy in Panama. I’ve also led workshops on how to create a solo show / memoir / personal essay at Princeton, CSULA, FIGT (in 2013 and 2014), and in private classes in Los Angeles. I’m astonished, thrilled, and humbled by the show’s life and hope to take it all over the world. Thank you, Lisa! Your experience at the FIGT conference sounds out of this world (figuratively as well as literally), and it’s wonderful to hear news of all the progress you’ve made since this time last year, when we first “discovered” your talent! Readers, please leave questions or comments for Lisa below. I loved reading this, Lisa! It was great to read what was going through your mind before and after the performance. I was blown away by your show at FIGT, so I’m really excited to see it again tonight and to share it with my husband too. Everyone I spoke with at FIGT lived your story with you as you performed it on stage. We were quiet because we were enthralled and the ATCKs in the audience were re-living their own experiences and emotions through your performance. I know that many of the parents I spoke with really appreciated getting an insider’s glimpse into their TCKs. There was something for everyone – you made us laugh, made us nod our heads in understanding and you moved us deeply. Congratulations on this amazing show, and on your upcoming bookings! Fingers crossed you get even more soon 🙂 Also, a big thank you for linking to my blog post – it means so much to me that you enjoyed and appreciated what I wrote. LOVE this. I hope to see your show one day!! Congrats, Lisa! I loved hearing about what the experience was like for you and how moved the audience was. I’m not surprised that you are now beginning to take your show around the country and the world. Lisa, like Dounia, I was also there at the FIGT conference and I was completely enthralled with your performance. You and I were sitting in the bar the night before and you excused yourself to go to bed early to rest up for your show. As soon as you started performing I realized why you needed to rest – what a tour de force! How brave you are to share your vulnerability, your honesty, and raw emotions. As I watched you, laughing at your insider jokes, and marveling at your acting talent, I kept thinking, “Everyone needs to see this show.” The best part for me? That you have the wisdom to bring your story full circle – the final scene when you’re with your parents in Africa where you show that you come to accept and appreciate how all of your experiences made you who you are today – that was priceless. I’m so excited that Alien Citizen is gaining more traction and that you’ll taking it on the road to new venues. This is wonderful to read, Justine. Thank you so much. It meant the world to me to have such a positive response at FIGT, and especially among professionals like you who work in cross-cultural fields. I wanted to engage much more at FIGT when I wash’t performing but was in pre-performance-conserving-energy mode most of the time. I hope to socialize more at future FIGTs, since that’s one of the best things about the conference! 🙂 Thank you for posting above; I am honored and grateful. HI Nshanti, what a lovely compliment! Thank you! My director, Sofie Calderon, kindly submitted me as a speaker to TED late last year but we haven’t heard back. Competition is very fierce. But I’ll check out the locations for the next few TEDx gatherings… Thanks again for your vote of confidence!